Press brakes have been around quite a while and if you have one that’s over ten years old, odds are it is time to be replaced. That’s not to say your 15-year-old press brake isn’t getting the job done – with proper maintenance it could still be the most reliable machine on your floor. The reason it might be time to bring in a new one has more to do with technological advancements in press brakes, specifically how they related to energy efficiency. Hydraulic press brakes are still very effective at what they are asked to do, but they utilize a few outdated processes to get the job done. First off, they send oil to the pistons through pressurized lines, which work quite well, but the gear pumps that start the process are always drawing power, even when the machine is not being used. The gear pump is just one area where traditional hydraulic press brakes are starting to fall behind the electric and hybrid types. There are other ways where the hydraulic brake press can be improved to increase efficiency as well, such as temperature changes to the oil. Fluctuating temperature is practically impossible to prevent and can cause a press brake’s ability to meet exact project specifications. The best way to combat these issues is to combine the best aspects of a traditional hydraulic press brake with those of a newer electrical model, in what folks are calling hybrid press brakes. 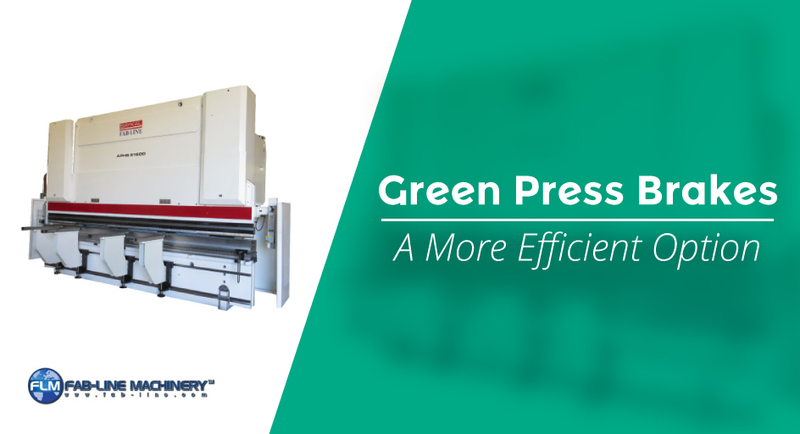 In a hybrid press brake, the gear pump is completely eliminated and replaced with a hybrid pump that only operates during parts of the day, rather than constantly. This also allows for exact positioning and worry-free operation when it comes to meeting exact specifications. Other than the massive increase in energy efficiency, hybrid press brakes are much more accurate. Less wasted energy means the energy that is used will go exactly where it needs to go to ensure the project is executed according to the plan. As mentioned previously, as hydraulic oil becomes hotter it transfers heat to the frame and compromises accuracy as well as repeatability. Harmful side effects also include a shift in ram of up to +/_0.006 in and possible seal damage. Hybrid press brakes use much less oil and aren’t always using power, eliminating these risks and ensuring complete accuracy. If you are in need of the latest in press brake technology and functionality, contact us at Fab-Line Machinery today.